Cilantro Lime Chicken Bites – A super quick and easy dinner idea that’s made with chicken, cilantro, lime, and garlic. Ready in less than 20 minutes! My name is Sharon and I am addicted to anything and everything with cilantro & lime. There, I said it. Ever since I tried the rice at Chipotle, I’ve been obsessed with this simple, yet powerful combination. It’s such a refreshing flavor, with a little bite from the citrus. I love it! Now, if I see anything on a menu with these two ingredients together – cilantro lime sauce, cilantro lime steak, cilantro lime anything- you can pretty much guarantee that I’ll be ordering it. I’ve already tackled a few cilantro lime recipes myself- this cilantro lime rice and these grilled cilantro lime skewers. Those skewers are unbelievably flavorful but they take some time to marinate so it’s not something I tend to make in a pinch. But these cilantro lime chicken bites, on the other hand, are perfect for a last-minute meal since it can be made in less than 20 minutes. Plus, because of my previously mentioned obsession with cilantro and lime, I already have all the ingredients sitting in my fridge so there’s nothing extra I need to buy. How much easier can you get?! But I started craving more substantial meals that were also quick and easy to make. I found this recipe on Pinterest and fell in love with it! Not only was it so simple but the chicken comes out crispy and with a huge punch of flavor. Just add some rice and beans and you have yourself a complete meal! 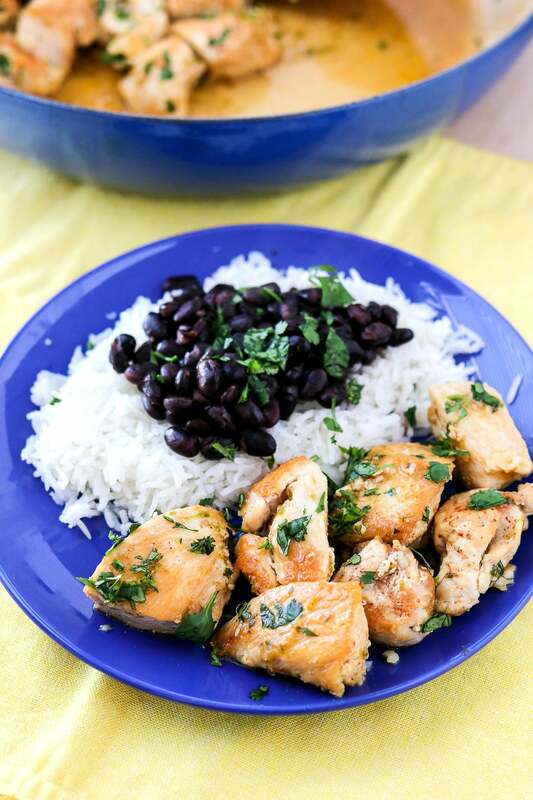 This main reason why theses cilantro lime chicken bites cook so quickly is because of the small size of the chicken. The smaller the surface area of your protein, the quicker it takes to raise to the desired temperature. You don’t have to cut the chicken into bites if you don’t want to, but just know that it will take longer for the chicken to cook. I love giving you guys tips and tricks to make sure that the recipe turns out perfectly. But this recipe is so easy that I don’t need to give you any tips! So go ahead and make this chicken this week. You’re gonna love it! And don’t forget to scroll past the recipe to check out some more of my favorite easy weekday meals! This post first appeared in Julie’s Eats and Treats, where I am a contributor. This look amazing! Pinned for later. This sound like my kind of dinner!! Can’t wait to make it!! Definitely pinning. This chicken looks delicious! You’re so welcome! Glad you enjoy them!! Cilantro and lime is such a great flavor combination. I was salivating looking at your photos! Looks really yummy and easy enough to make for a nice quick dinner. This looks amazing! Also the perfect kid friendly cinco de mayo dish! I love their rice, too! This seems simple and easy. I think I need to try it out this weekend! Let me know how you like the recipe! Wow this looks amazing! I have never tried this before maybe I can use the recipe this weekend. Thanks for sharing! Hi Sharon. I’m Jolina and it looks like we’re in the same cilantro/lime support group lol! It’s one of our favourite, go-to flavour combinations. And these chicken bites look incredible! Bahaha! Glad I’m not the only one! I make something similar to this quite often, it is the best! And pretty easy to whip up 🙂 yum! Sounds so fresh and light for Summer! We love chicken, we cook it a couple of times a week, but it can get so boring! This looks like a nice and easy update we can make over and over again. Yum! Exactly! I was so bored of the plain chicken I would make. This was an easy and quick way to jazz it up! That looks amazing! I’m so trying this next week! I pinned this because I have been craving cilantro like anything. This looks fabulous and I like how it can be made quickly. Thank so much! I hope you get to try it soon! This looks super tasty and I love quick to make items. I LOVE cilantro! I keep trying to grow it in my window sill because I love the smell! This recipe is a must try! Oooo good idea! I use it so much so I should try to grow it too! I’m going to be lookin good Cookin, thanks for the recipe. I’m doing it tonight! You’re welcome! Let me know how it turns out for you! So going to give this a try even though I’m not the biggest coriander fan these look too good not to make. Wow that’s great! Let me know if they change your mind. Must. make. this. soon. Looks incredibly tasty!